Drawer dishwasher from Fisher & Paykel Appliances receives updated styling with new black finish. The Dishwasher can be installed flush with kitchen cabinetry, leaving minimal gaps and allowing a more streamlined kitchen design. Offering more choice alongside existing stainless steel or white appliances, the new DishDrawer Dishwasher provides a contrast to a traditional kitchen. 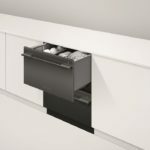 The DishDrawer Dishwasher features 15 different wash programs, which include Rinse, Fast, Delicate, Normal Eco, Normal and Heavy, to provide a wash for every situation. Additionally, the two independently operating drawers each allow a half load. The half load function supports small, fast washes and uses less water, providing the perfect solution for simultaneous washes of different sized loads. Now in its ninth generation, the DishDrawer Dishwasher entered the marketplace over 20 years ago.